(Boynton Beach, FL) – Today, doctors at Bethesda Heart Hospital announced that they are the first in Palm Beach County to offer patients the new sutureless Perceval valve for aortic valve replacements (AVR). Perceval is a surgical, biological valve that is designed with a self-anchoring frame, enabling surgeons to replace the native, diseased valve suture-free. The main advantage of using sutureless aortic valve replacements is the reduced time required to keep the heart from beating as the valve is positioned compared with valves that must be sutured in place, which is a tedious and lengthy process. As a result, the patient spends less time under anesthesia and less time on the cardiac-lung bypass machine, thereby leading to a faster recovery with fewer complications. “I am delighted with the outcome of our 63-year old patient today,” said Dr. Montoya. “This biological valve makes it possible for her to avoid taking blood thinners for the rest of her life,” said Dr. Montoya. “We expect this new valve will last her 15-25 years,” he added. After recovering in Bethesda’s CV-ICU for the next 4-5 days, the patient, who works as a Registered Nurse, will be able to live a full and healthy life, resuming normal activities in the next four weeks, with a full recovery expected in 8-weeks, according to Dr. Montoya. Dr. Montoya was assisted in today’s case by fellow cardiovascular surgeon and father, Alvaro Montoya, M.D., who is one of Miami-Dade’s most experienced surgeons and one of the principal investigators on the Perceval device. 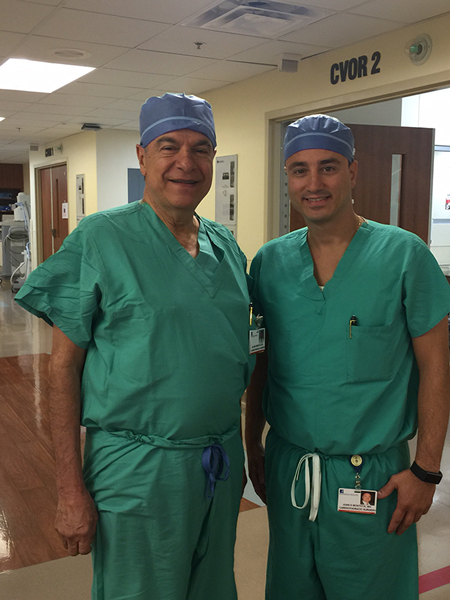 The father and son team has performed more than 1,500 cardiovascular surgeries together in South Florida since 1999.